sky is black. ground is [wood]. the hand is leaning -90 degrees to the north. the hand is 7 inches above the ground. hand is [Yellow]. hand is shiny. light is behind of the hand. second light is north of the hand. third light is under the hand. fork is -4.5 inches east of the hand. the fork is facing the west. the fork is leaning -90 degrees to the west. the fork is 7 inches above the ground. the fork is gray. wall is 5 inches east of the fork. the wall is facing the west. 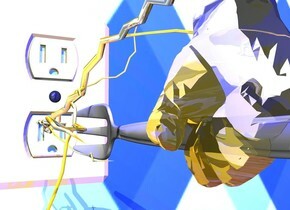 the wall is [Blue]. the wall is above the ground. big outlet is 4.5 inches east of the fork. the outlet is facing the west. the outlet is 5 inches above the ground. lightning is west of the outlet. the lightning is leaning 100 degrees to the west. the lightning is 3 inches above the ground. the lightning is gold. the lightning is shiny. three blue lights are above the lightning. gigantic tube is -30 inches above the ground. the tube is leaning 90 degrees to the north. track is in front of the tube. the track is above the ground. train is -5 inches above the track. the train is 3 feet tall. the train is facing the north. the tube is tile . businessman is -1 inch above the train. the businessman is 2 feet tall. the businessman is 5 feet in front of the tube. small gun is -1 inch right of the businessman. the gun is 5 inches above the train. the gun is leaning 90 degrees to the south. small hand is 5 feet in front of the businessman. the hand is facing the west. the hand is leaning -110 degrees to the east. shotgun is -10 inches above the hand. 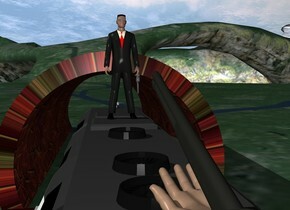 the shotgun is facing the businessman. the shotgun is leaning -15 degrees to the south. 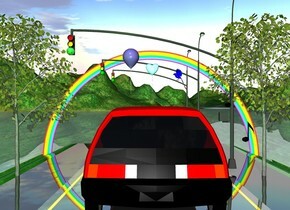 Trafic signals are all green! honda is 10 inches left of first signal. the honda is facing east. second signal is 150 inches right of the first signal. third signal is 100 inches right of the second signal. very small rainbow is right of the second signal. the rainbow is facing the east. the rainbow is -10 inches above the ground. bird is -20 inches south of the honda. the bird is 80 inches above the ground. 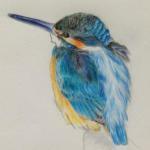 the bird is facing the north. 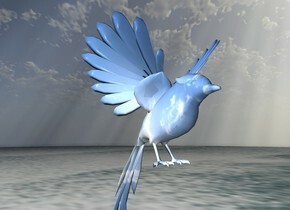 the bird is blue. green light is north of the honda. the green light is 80 inches above the ground. freeway is 0.3 inches under the honda. the freeway is facing the east. the freeway is shiny. small linden tree is -30 inches south of the first signal. small linden tree is above the ground. second small linden tree is 120 inches north of the first signal. second small linden tree is above the ground. first small green sphere is -8 inches south of the second small linden tree. green sphere is shiny. green sphere is 110 inches above the ground. second small green sphere is 180 inches east of the first small green sphere. third small green sphere is 130 inches east of the second small green sphere. first balloon is east of the honda. first balloon is 80 inches above the ground. first balloon is sky blue. the balloon is facing the east. second balloon is 10 inches north of the first balloon. second balloon is mauve. small eighth note is 20 inches south of the honda. the eight note is facing the west. the eight note is 50 inches above the ground. small half note is 10 inches south of the honda. the half note is 70 inches above the ground. the half note is facing the west. the half note is black. second scorpion is 140 feet right of first scorpion. golden shiny enormous pyramid is in front of the second scorpion. emperor scorpion is 20 feet right of second scorpion. golden shiny gigantic pyramid is behind the emperor scorpion. third scorpion is 30 feet right of the emperor scorpion. golden shiny very gigantic pyramid is 30 feet behind the third scorpion. small sphinx is -20 feet in front of emperor scorpion. small sphinx is shiny. boulder is 120 feet in front of enormous pyramid. the sphinx is facing the boulder. big egyptian statue above the sphinx. christmas ornament is behind the egyptian statue. first gigantic wing is -10 inches left of the christmas ornament . first gigantic wing is 1 foot above the sphinx. second gigantic wing is -9 inches right of first wing. second gigantic wing is facing the north. first wing is shiny jade green. 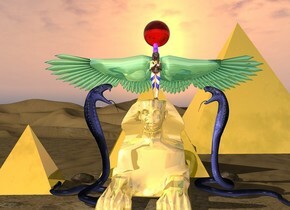 second wing is shiny jade green. . first rock is right of the sphinx. second rock is left of the sphinx. first huge cobra is 20 inches in front of the first rock. second huge cobra is in front of the second rock. first cobra is facing the cobra. second cobra is facing the first cobra. first cobra is navy. second cobra is navy. eta is 50 feet behind the sphinx. enormous clear orange sphere is right of the eta. the sphere is 35 feet above the ground . yellow light is in the sphere. big egyptian statue is shiny. 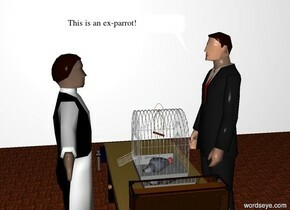 The Parrot Sketch from Monty Python's Flying Circus. the man in the room. head of the man is image-10012 . hand of the man is image-10012 . the man is facing to west. workbench is left of the man. the workbench is facing the west. birdcage is on the workbench. parrot in the birdcage. the parrot is leaning 90 degrees to the left. small fish tank is 20 inches in front of the birdcage. the fish tank is -6 inches above the workbench. waiter is left of the workbench. the waiter is facing the east. the waiter is -5 inches above the ground. sky is [sky] . a bed is left of the alpha. beta is 25 inches behind the alpha. pillow of the bed is white. blanket of the bed is [checked]. a nightstand is 90 inches left of the beta. the table lamp on the nightstand. a penny is right of the table lamp.the penny is facing up. a small quarter is 2 inches behind the penny. the quarter is facing up. a dime is 1 inch right of the quarter. the dime is facing up. yellow light above the table lamp. a man is -40 inches above the bed. the man is 50 inches left of the alpha. the man is facing up. the man is leaning 15 degrees to the south. eyeball of the man is black. very small north star is 1 inch above the table lamp. the north star is facing the right. small ornament is 3 inches in front of the star. The essence of modern-day people. building is right of small sears tower . high rise is left of the small sears tower . high rise is behind the small sears tower. skyscraper is behind the small sears tower. dodge viper is in front of the small sears tower. first gigantic beluga is 150 feet above the skyscraper . gigantic blue whale is 300 feet behind the first gigantic beluga. 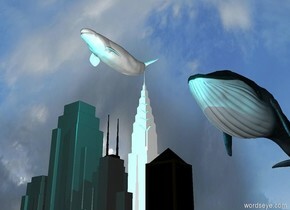 high rise is under the gigantic blue whale . first cyan light is two feet above the first gigantic beluga . second cyan light is in front of the beluga. the yellow light is under the high rise . 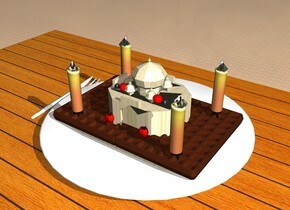 Would you like a piece of taj mahal? ground is wood. very gigantic dish on the gigantic kitchen table. the kitchen table is facing west. the tiny taj mahal on the gigantic dish. the taj mahal is facing north. the gigantic fork is right of the dish. the fork is facing the north. the fork is shiny. the first very gigantic waffle is -155 inches right of the taj mahal. the second very gigantic waffle is -155 inches left of the taj mahal. the first waffle is 0.1 inch above the dish. the second waffle is 0.1 inch above the dish. the big eighth note is 30 feet north of taj mahal. the big heart is 95 inches right of the big eighth note. the big alpha is 90 inches left of the big eighth note. the first gigantic candle is 358 inches in front of the heart. the first gigantic candle is 30 inches above the dish. the second gigantic candle is 540 inches in front of the heart. the second gigantic candle is 30 inches above the dish. the third gigantic candle is 366 inches in front of the alpha. the third gigantic candle is 30 inches above the dish. the fourth gigantic candle is 545 inches in front of the alpha. the fourth gigantic candle is 30 inches above the dish. tower of the taj mahal is clear. the first gigantic strawberry is 50 inches right of the third candle. the second gigantic strawberry is 70 inches left of the first candle. the first enormous cherry is 40 inches in front of the first strawberry. the first cherry is 80 inches above the dish . second enormous cherry is 40 inches in front of the second strawberry. the second cherry is 80 inches above the dish . first sphere is -10 inches left of the first cherry. second sphere is 2 inches right of the second cherry. the first sphere is [blueberry] . the second sphere is [blueberry] . facade of the taj mahal is [biscuit] . dome of the taj mahal is [marble] . the fowl is 100 feet above the ground. the fowl is image-10048 . eyeball of the fowl is [sky] . tail of the fowl is [sky] . leg of the fowl is [sky] . 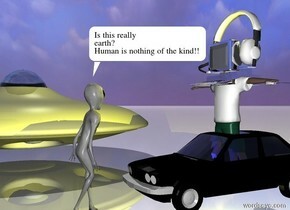 claw of the fowl is [sky] . beak of the fowl is [sky] . ground is [wave] . the ground is [lava]. the ground is shiny. sky is [sky texture] . the volcano on the ground. a first small wave is 150 feet left of the volcano. the gigantic wave is 300 feet in front of the small wave. the gigantic wave is image-10041 . the enormous surfboard is -80 feet left of the gigantic wave. the enormous surfboard is -5 inches above the ground. the enormous surfboard is [sea] . a second small wave is 450 feet in front of the volcano. the enormous surfboard is facing the a second small wave. the enormous surfboard is 370 feet in front of the first small wave. 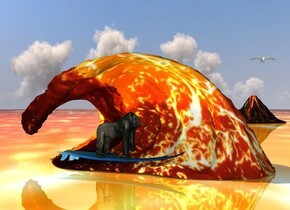 the huge gorilla on the enormous surfboard. the enormous headwear is -120 inches right of the gorilla. the enormous headwear is facing the a second small wave. the enormous headwear is 250 inches above the ground. the enormous headwear is -340 inches in front of the gigantic wave. the enormous seagull is right of the gigantic wave. the seagull is 50 feet above the ground. yellow light is left of the gigantic wave. ground is clear. dresser in the room. small woman is in front of the dresser. the women facing the dresser. the enormous butterfly is in front of the women. the butterfly is 8 inches to the left of the ground. the butterfly facing up. wing of the butterfly is [pink]. the lipstick is -35 inches above the dresser. lipstick of the lipstick is red. the small clear nail polish is -35 inches above the dresser. hairbrush is -35 inches above the dresser. hairbrush facing right. handle of the hairbrush is [wood]. sky is image-10013 . the ground is grass. 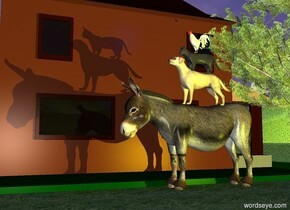 the donkey is right of the house. the dog on the donkey. the cat on the dog. the chicken on the cat. The dim blue light is two feet above the chicken. the tall grass on the ground. the grass is right of the donkey. the tree is behind the donkey. the donkey is hitting yellow light . 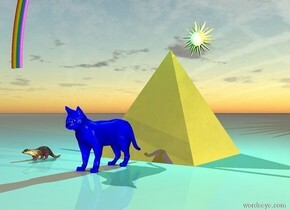 the enormous shiny golden pyramid is behind the huge blue house cat. the big brown Otter is six feet to the left of the house cat . The cyan light is two feet above the pyramid. The yellow light is two feet above the jellyfish. sun symbol is behind the pyramid. sun symbol is 10 feet to the left of ground. over the rainbow on pyramid. 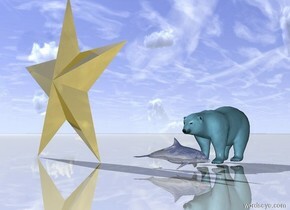 the golden dolphin is 2 inches in front of the big sky blue Polar bear. dolphin is facing right. the ground is shiny. the enormous golden star symbol is 2 feet to the left of the dolphin.